Tolomatic's Slide-Rite™ CR has all the advantages of the Slide-Rite — leak-proof, floats in either direction on keyed shafts, maintains perfect alignment, easy to install — PLUS it is corrosion resistant. 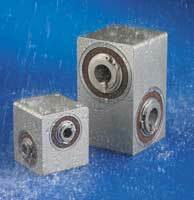 The Slide-Rite CR is the perfect choice for applications that require hostile environments. They are prelubricated and ready for installation.